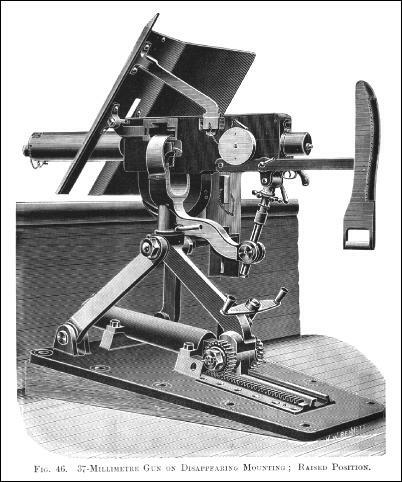 A description of the Maxim 37mm machine gun, later called the Pom-Pom. The article was published in the Engineering journal volume 65, April 1st 1898 as the fourth part of a 4-part survey of Maxim guns. In this transcription, the figures have been interspersed within the text to improve clarity. rob1904. 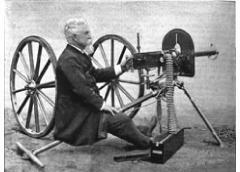 THE MAXIM GUN. - No. IV. In Fig. 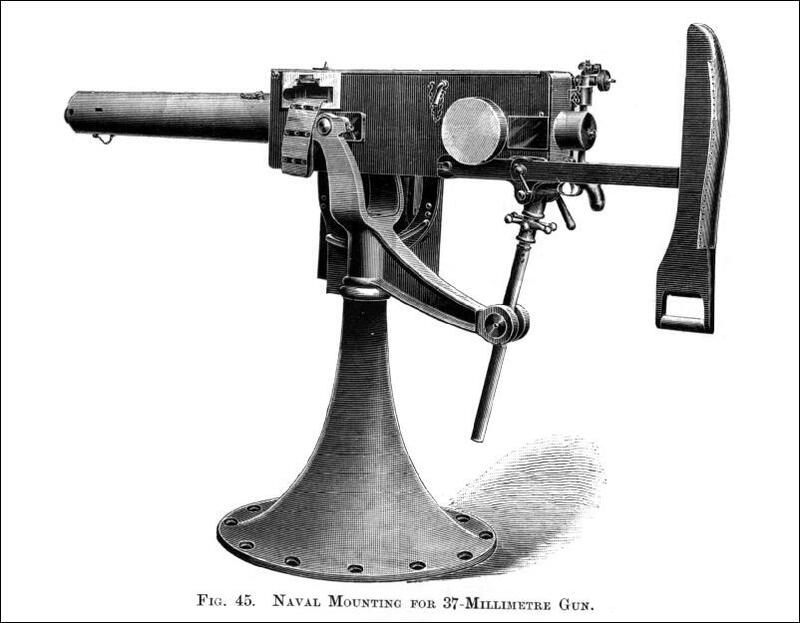 45, on the present page, we illustrate a 37-millimetre gun on ordinary naval mounting. This cone mounting is used for broadside and bridge work, and is occasionally used as a mast-top mounting when there is room in the top. As a rule, however, the space is too confined, and a rail mounting is therefore generally used. In the latter a rack goes all round the rail, or as far as the arc of training may render it necessary; and the gun and mounting are made to traverse bodily on the rack by means of a handle which rotates a pinion gearing into the rack. There is, of course, the ordinary training by means of a shoulder-piece. There is a vice for clamping the pivot when the gun is not in use, and another for holding the carriage steady when firing. Mountings adapted for the different services for which the gun is used have been designed. In some of them the T-piece, or other attachment of the gun, works in a socket in the mounting; in others it is cylindrical and slides over a pivot on the mounting. In either case the gun is capable of moving freely in a horizontal plane, but, of course, can be clamped in any position. In Figs. 46 and 47 is shown the 37 – millimetre gun on a disappearing mounting, the former engraving showing the gun in firing position, whilst the latter illustrates the gun housed behind a full-sized model of a ship's bulwark. The weight of the disappearing mounting is 15 cwt. 1 qr. 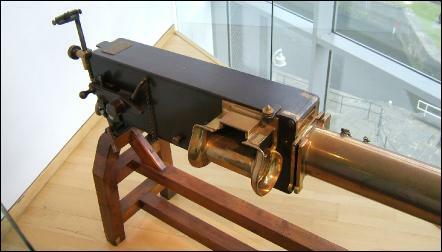 22 lb., which brings the weight of gun and mounting to close on 19 cwt. To lower from the firing to the housing position, the shield is first folded down, and the gun is then turned to the right parallel with the bulwark. The gun is then lowered by means of the double handle shown, which, by means of worm gearing, rotates the toothed pinion which engages with the teeth on the horizontal rack. This extends the rear leg of the tripod, the two front legs being free to move on the pin joints. A bolt goes through the hole in the rack frame to lock the gun in the firing position, but firing can be carried on without this being in place, and with the gun in any position. In the horizontal lower cylinder, shown clearly in Fig. 47, is a powerful spiral spring, which is compressed by the action of lowering, and, by its reaction, assists in the raising of the gun. This mounting is chiefly used for fortifications, although it is here illustrated in connection with marine work. It now remains to describe the mechanism of the 37-millimetre gun. Figs. 49, 50, and 51 show respectively a sectional elevation, a sectional plan of the gun, and an outside elevation of the breech end. It will be seen that this gun differs most essentially from the rifle-calibre Maxim gun recently described, in the arrangement of the springs. In place of the spiral fusee spring for bringing the barrel back and closing the mechanism, as in the rifle-calibre gun, there are two powerful springs for operating the mechanism and bringing the barrel back into firing position. The gun and its mechanism may be divided into two parts, the recoiling and non-recoiling portions. The former include the barrel B, the recoil plates R, the lock with crank C, and the crank handle D. The barrel is provided with trunnions, to which the recoil plates R are attached. The crank C, with its connecting-rod, is attached to the lock by means of a bayonet lock, the shaft of the crank passing through the outside plates E, and having fixed on its left-hand end a volute spring K, the latter being inclosed in a circular gun-metal box. On the other end of the crank is the crank handle D, which rests against the roller L when the gun is closed, as shown in Fig. 51. The non-recoiling part consists of the breech casing E, the water-jacket S, and the rear block H. A hydraulic buffer is fitted to the rear block for the purpose of controlling the recoil. 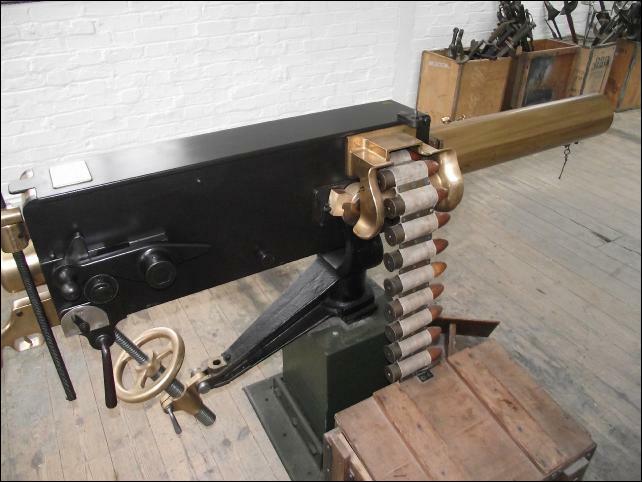 The belt system of feeding up the cartridges is used with this gun, there being two movable and two stationary pawls in the feed-block for the purpose. The former are fixed to a slide in the upper part of the feed-block, and this slide is moved from left to right by levers actuated by the barrel when it recoils. These pawls are pressed down by a spring and engage behind the cartridges, and when the barrel returns the pawls place the cartridge still in the belt immediately over the chamber. 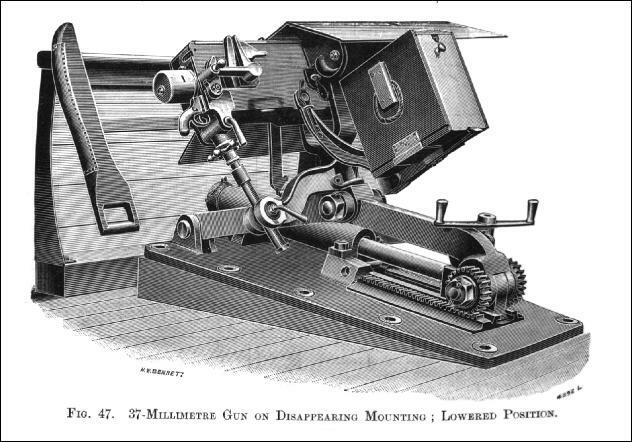 Supposing the gun to be loaded, that is, one cartridge being in the barrel, the upper part of the carrier A of the lock will have seized the base of one cartridge in the belt above. When the gun is discharged the barrel, with the recoil plates and mechanism, recoils about 37 millimetres (11/2 in. ), and the spiral spring which surrounds the barrel is compressed. During the recoil, the crank handle D remains in contact with the roller L, which is attached to the outside plate. The curve of the crank handle is so set out that the latter receives a circular movement, which is accelerated during the recoil. Reference to Fig. 50 will show this. The mechanism is thrown back clear of the breech sufficiently far to extract the empty case from the barrel, and a fresh cartridge from the belt in the feed-block. The turning of the crank brings the volute spring attached to the crankshaft into tension. As the lock travels backwards the carrier A drops down, being guided by certain cams I fixed to the casing of the gun, and the guide-block attached to the cover. When in its lowest position, the carrier places the new cartridge, which it has taken from the belt, opposite the chamber of the barrel, whilst the empty case is placed opposite the ejecting tube X. The carrier has grooves only two-thirds of its length, in the same manner as in the rifle-calibre gun already described, whilst the cartridge is held firmly by a spring gib, the position of which can be traced in Fig. 49. The reaction of the spiral spring which encircles the barrel next brings the latter and the recoil plates into the firing position; the lock in moving forward pushing the new cartridge into the chamber, and the empty case into the ejecting tube. During the last part of the forward travel of the lock the carrier A is lifted by levers G which engage with lugs on the carrier. These levers are actuated by suitable projections or lugs which form a part of side levers connected with the crank. These lugs cannot well be traced in Figs. 49 and 50, but the end of the lever G can be plainly seen engaging the carrier. The carrier in rising engages with the base of a fresh cartridge in the belt, and the carrier being only grooved two-thirds of its length releases the empty case, which is ejected through X. As the lock is brought to the rear and away from the breech by the action of the crank, the rear part of the side levers attached to the crank depresses a tumbler M, and this draws back the firing-pin, the position of which can be seen in Fig. 49, and compresses the main spring. When the tumbler is down the nose of the hand sear p is forced into engagement with a bent in the tumbler by the action of the main spring s. There is also a safety sear n which prevents the firing-pin being released before the lock is home and the carrier in the firing position. To load the gun insert the end of the belt into the feed-block from the right (shells pointing to the front), turn the crank handle fully over to the front, pull the belt to the left as far as it will go, and let the handle fly back; again turn the handle over to the front, pull the belt to the left, and on letting the handle go, all is ready for firing. When one round has been fired the action is automatic, so long as pressure is maintained on the trigger, which is beneath the pistol handle, as shown. To unload the gun turn the crank handle fully over to the front twice and let it go; this insures the carrier being empty, but a live cartridge will be left in the ejector tube; this can easily be withdrawn by hand if the lock is drawn back by turning the crank handle to the front. To provide for safety there is a special arrangement with indicator lever, which when turned to the "safe" position locks the trigger, so that it cannot be pulled back by the finger.